Author’s Note: The Flashback articles on here I originally wrote for the website royalsbaseball.net. That website has now become defunct, so I thought I would move them over here to Bleeding Royal Blue. I’d like to thank Joel Matheny for giving me the opportunity to write for his website, even if it was for just a few months. So enjoy, and go Royals! With the 2012 Kansas City Royals season less than a week away, I normally take this time to put forth my predictions for the upcoming season. The thing is, I kind of have with a lot of my articles as of late. So, I thought it would be fun today to take a look at ‘Fake Predictions’ for this Royals ball club. These are all just jokes, and it’s supposed to be a fun way of looking forward to opening day. So enjoy, and please, try not to take this too seriously! 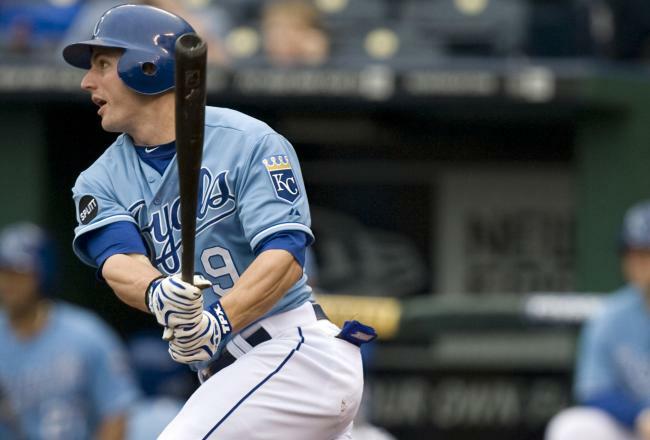 Chris Getz’s new stance will pay dividends, as 3/4 of his hits this season will be extra base hits. 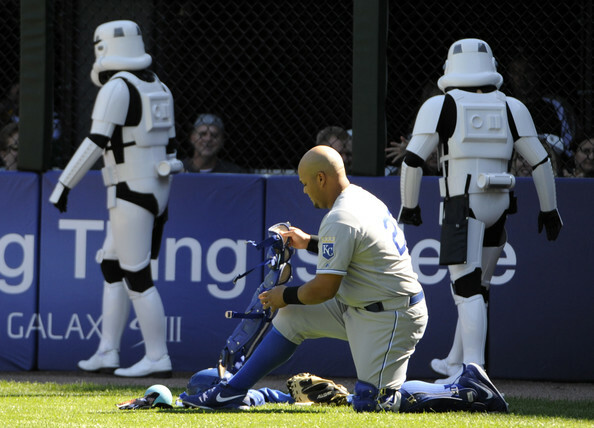 With Salvador Perez out with an injury, the team looks into cloning him. Unfortunately, the team sends in the wrong DNA, and instead the Royals get a clone of former Catcher Ellie Rodriguez. After a few pitching injuries early in the season, GM Dayton Moore finds Kyle Davies in the backwoods of Georgia, and signs him to a minor league contract. He now wants to be known by his given name, Hiram. With Royals infielder Yuniesky Betancourt having trouble with his range, the team buys him a segue-way to make it easier for him to get to grounders balls to the left and right of him. 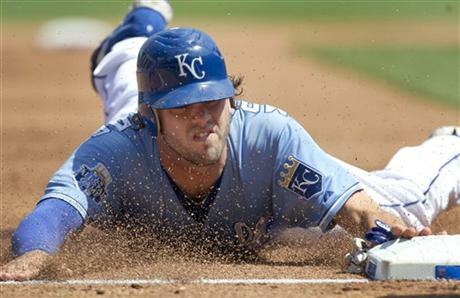 After a slow start, Mike Moustakas will go on a tear. 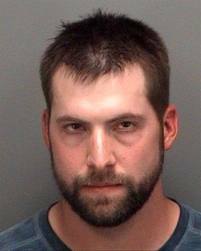 Even more interesting, Moustakas will end up stealing 30 bases, as he finds cutting his hair gives him extra speed. Bruce Chen continues to frustrate White Sox managers, as the team’s new skipper Robin Ventura goes on a expletive laden tirade that would make Ozzie Guillen proud. Johnny Giavotella will return to the ball club during the season, but when he shows up to the ballpark, he is told he isn’t ‘tall enough for the rides’. Royals fans beg for the flames normally used for Joakim Soria’s entrance. Unfortunately, it doesn’t have the same affect when Everett Teaford enters the game. Eric Hosmer has a superb season, enough so that he ends up as a spokesman for Loreal hair products. Alcides Escobar is praised for his defense, but even more so when he makes a play near the third base line, throwing out the runner – Who happens to be Bengie Molina. Rex Hudler will make most of the Royals fanbase mute their Tv’s and force them to listen to the radio while watching a Royals game. Royals Owner David Glass will show up for two dozens game this season, instead of his usual dozen. 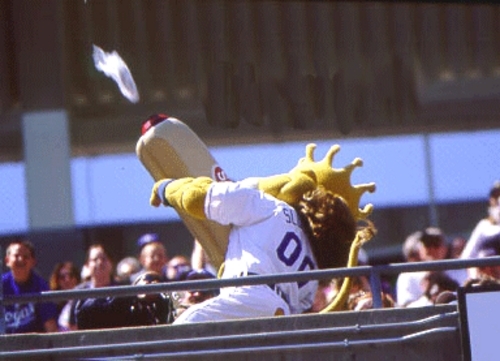 When Sluggger is forced to throw hot dogs instead of shooting them, the team finds out that he has a really good arm. Sluggger is then signed to a contract and sent to AAA Omaha. Tim Collins develops a growth spurt and ends the year 5′ 10”. Billy Butler gets off to a bad start. With the extra pressure on him, Billy Loses 20 lbs in a month. Luis Mendoza continues his excellent pitching, winning close to 20 games and turning out to be the ace of the staff. Royals fans everywhere are glad Kevin Kouzmanoff doesn’t make the team, as many were afraid they would have to either pronounce his last name or spell it. Instead they are stuck trying to figure out how to pronounce ‘Bourgeois’. Mid-season, the team wants some new blood, so they go out before the deadline and acquire Miguel Olivo and Willie Bloomquist, saying they are ‘just want this team was missing’. Hitting Coach Kevin Seitzer proves he is a man of magic, turning Yuniesky Betancourt and Humberto Quintero into walking machines, as the two are near the top of the league in walks. Brayan Pena will be cut once Sal Perez comes back. Because he loves the team so much, he will stay and take over Sluggger’s job. Jose Mijares will realize a game moves faster when he doesn’t step off it after every pitch, and becomes what baseball experts call a ‘fast worker’. 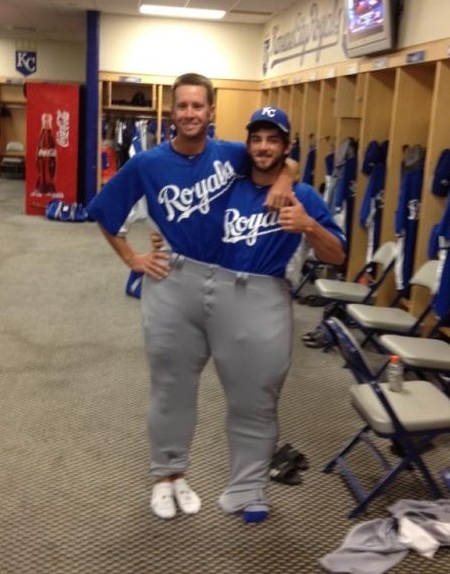 Jonathan Broxton will arrange a contest to see if he can get 3 of his teammates to wear his pants all at once. Mitch Maier starts more than once a month this season. 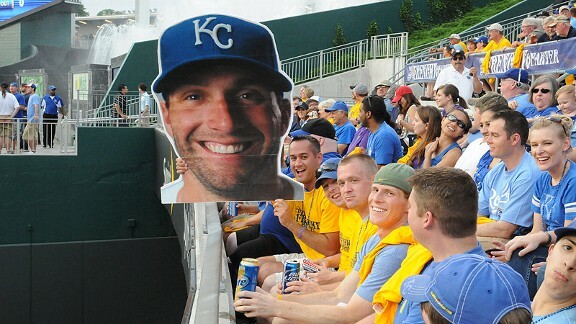 Jeff Francoeur will prove how fan friendly he is, as he will spend half an inning hanging in the ‘French Quarter’. Sean O’Sullivan will pitch so good that I will quit calling him by the nickname I gave him. A fan won’t wear a $200 All-Star game jersey to a game and still not know the basics of baseball. The first place Royals fans will flock to read incite on the team will be in the comments section of Facebook. 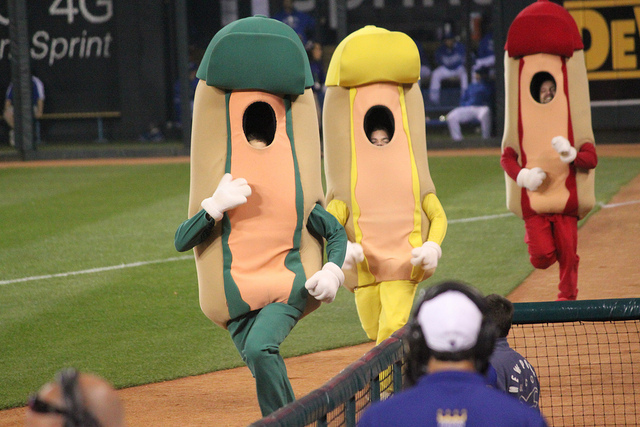 and finally, I will root for relish this year for the first team in the classic Mustard, Ketchup and Relish race. 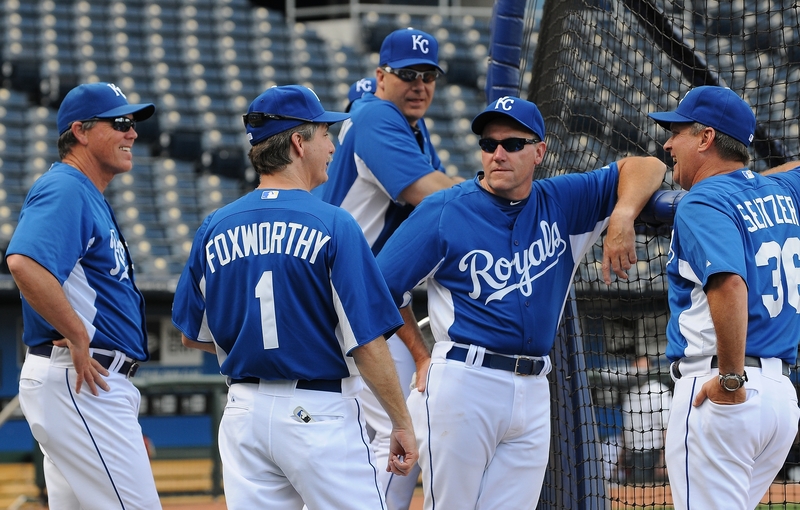 Enjoy the 2012 Royals season everyone! Now let’s talk some baseball!